The process of having to judge cannabis quality happens in two phases. The initial evaluation—when you touch it, smell it, and look at it both with the naked eye and under magnification—let’s you look at how the marijuana was trimmed and cured, and allows for some educated guesses on how this weed is going to smoke and taste. The second phase is the actual smoking or otherwise consuming of the marijuana, when you taste, again smell, and finally experience the effects of the plant. Together, these two phases make up a full exploration of marijuana quality. Scent – The marijuana aroma should be the first element of the flowers to greet you. There are 200 terpenes and terpenoids—little compounds that naturally create aroma and flavor in the plant while impacting THC potency—present across marijuana strains. As a result, there is a wide range of aromatic notes you find in marijuana. Citrus, diesel, pine, cinnamon, chili pepper, grape, and damp moss are just a few of the scents you may come across in a bud’s bouquet. Poorly cured marijuana smells like hay, or it loses most of its scent all together. These are to be avoided. Marijuana that has a pungent and lingering aroma is worth a closer look. Color – Marijuana color ranges from mint green, to so purple it is quite nearly black. Color is mostly about genetics, and a little about how the plant was grown. Some purple strains will only turn purple when exposed to low temperatures during flower. The hairs, which in fact are dried pistils of the flower, bring shades of red and orange to the visual experience of marijuana. Regardless of exact color shades, marijuana color should be even and vibrant. Steer clear of anything with gray splotches. Trichomes – Trichomes are the sparkling ‘crystals’ that coat dank buds, and they are one of the key indicators of when to harvest a plant. 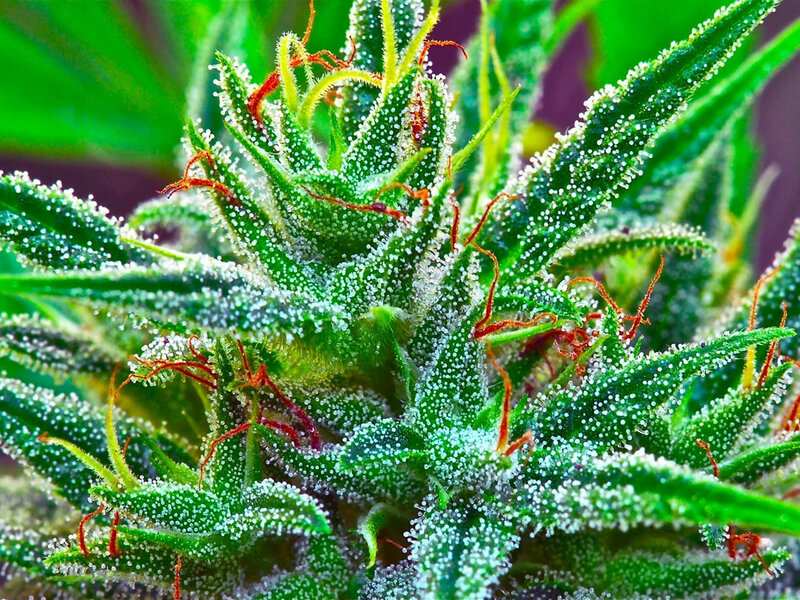 Trichomes also create the sticky tactile quality of marijuana. These little stalks—they look like tiny mushrooms under 40x or 50x magnification—are where lives a lot of the biochemical magic of marijuana. When you look at the trichomes under magnification, they should all be milky white, with a minimum of 30% of the trichomes an amber color. The more amber trichomes, the longer the marijuana was allowed to mature on the living plant, and the more impactful the effects should be. Anything past 70% amber was left too long. Moisture – High quality marijuana is not bone-dry. It should be sticky, a little moist, but not so much so that the container fogs or has obvious moisture in it. Weed that is too dry is more harsh in smoke. Flavor – The cleanliness of your method of delivery is important when evaluating flavor. A dirty pipe will mask the specific notes. Curing plays a roll in how the flavor turns out, but how the plant was treated in flower and in its final weeks will have a huge impact on what you taste. Metallic or chemical flavors suggest the plant was not fully flushed with water before final harvest. Burns to even gray ash – Marijuana that burns to a soft, even, gray ash is without the impurities or trace chemicals that are found in marijuana that burns unevenly and leaves dark muck. Finding this clean ash is confirmation of the plant matter’s even, clean burn. Becoming a marijuana connoisseur requires practiced attention and patience. Paying close attention to the details mentioned here will help you become more comfortable in evaluating marijuana quality. Use this knowledge to make better purchasing choices or to better focus on what you’re trying to accomplish as a grower.